Chadhiyana.com | Thank You, Inbeon Con! Like a lot of shows I’ve been doing this year, Inbeon Con was much smaller than shows like New York Comic Con (well, really, what show isn’t smaller than NYCC?) or even Boston Comic Con. Though, I’m finding sometimes the smaller shows turn out to be a bigger success than the larger ones, especially one day shows as they tend to be the most intimate between the attendees and the exhibitors and there’s less competition at the show. 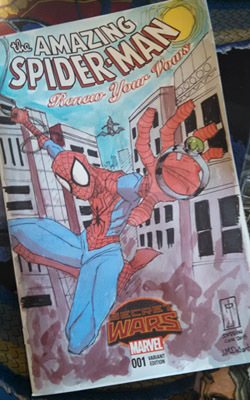 I had a lot of fun this weekend, talking to people, signing prints, books and even doing a few commission sketches (a Hellboy and a Spiderman–my first superhero sketch and my first sketch cover (never mind I haven’t drawn Spiderman in about twenty years). Oh, and eating the free, fresh-baked sweets of my neighbor, Glen Urieta’s wife (they were delicious–and thanks for The Papercut Kids book too, I hope you both enjoy Chadhiyana). Also, getting a chance to see Eric, his wife, my sometimes editor, Mr. Mark Mazz, James and Emilio Rodriguez (no relation–the artist and writer of Sara Rising), the gentlemen at MAS Media Studios, inker Alex Rivera and Fat Guy Inc’s Brendan Shaw was great. I’ve always loved doing conventions, and this year I’ve been pretty well booked for what my normal schedule looks like. Seven shows already since April. It’s been my biggest year of public appearances save 2013, when I spoke at a college, appeared at a comic shop event, and did two gallery shows on top of my convention appearances. 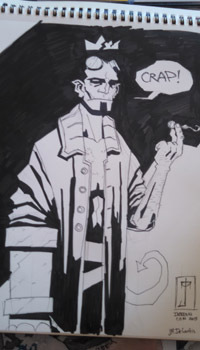 That said, I am looking forward to the two month break from conventions between now and the New York Comic Con (unless one of the shows I decide to do is one of the September shows–I’m still debating this). 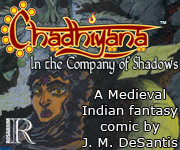 Chadhiyana #2 is due out next month, and I’m going to need the time to focus on the final edits to that issue while I work on the art for issue 3. Plus, I’m hoping, there may be a few more surprises in the coming months, which will require some additional attention from me. We’ll see. 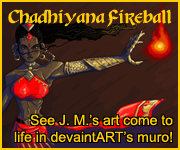 Things get delayed all the time in the creative worlds, but one thing I don’t want to fall behind on is Chadhiyana; that at least will be worth the break. So, it’s back to work. Thanks again for all the support at Inbeon Con and all of the conventions this summer–and even in the spring. I’ll see you all again in the Fall, though you can keep abreast of everything until then by reading my weekly blog (on jmdesantis.com) and by checking here on chadhiyana.com occasionally for updates.